Britain’s vote to ditch the European Union offers the chance of a new beginning — not just for the EU, and the U.K., but for Africa. Since most countries on the continent gained independence in the 1960s and 1970s, they have mindlessly mimicked Western political institutions. Rome has a basilica; so, too, must Yamoussoukro in Ivory Coast. France once had an emperor, so Jean-Bédel Bokassa spent $25 million on a coronation ceremony in the Central African Republic. The United States has a space center. Now Nigeria does too, at the cost of $89 million, though more than half its population lives on less than $1.25 per day. Of the putrid carcasses of failed foreign systems that litter the continent, none is more rancid than the African Union, which, as it happens, was modeled on the EU. The AU has proved equally inept on the economic front. The body couldn’t even afford to build its own headquarters, so China picked up the tab for its glitzy $200 million building in Addis Ababa, Ethiopia. Of course, any number of corrupt African dictators could have funded the headquarters. Sudan’s president, Omar al-Bashir, for one, is worth an estimated $9 billion. Even Isabel dos Santos, the daughter of Angola’s president, could have built it with her personal fortune of $3.2 billion. But it’s what has happened — or hasn’t happened — inside those headquarters that is the real disgrace. It was hoped that the AU could help spur industrialization by facilitating deeper economic integration and building much-needed infrastructure, including roads, railways, and telecommunications systems. It has failed spectacularly on both fronts. 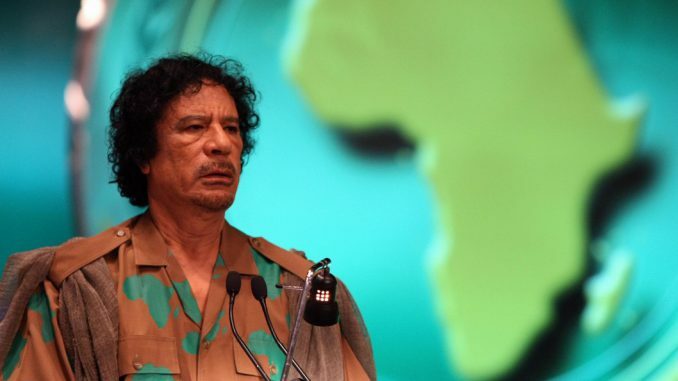 Qaddafi may have been deluded and a tyrant, and his blithe proposal for a United States of Africa indicates as much, but his critique of the African Union was sound. Africa must stop blindly copying the West and look to its own indigenous heritage for models of political organization. The continent has a long history of effective institutions for good governance: loose confederacies, participatory forms of democracy based on consensus under chiefs, and free village markets, to name just a few. All of the ancient African empires — Mali, Ghana, Great Zimbabwe, and Songhai in what is now the western Sahel — were confederacies characterized by great devolution of authority and decentralization of power. Markets were likewise ubiquitous in precolonial Africa, and prices were typically determined by bargaining, not dictated by authorities. Denim, dreadlocks and democracy: When does cultural appropriation become exploitation?